Make the most of your next event and host on California's beautiful Central Coast with the help of Pismo Lighthouse Suites. With flexible meeting rooms, modern amenities, and the Pacific Ocean as your backdrop, our versatile venues in Pismo Beach are ideal for a variety of events, from business luncheons and corporate gatherings to family reunions and holiday parties. Let's start planning—choose from our rental spaces below and let the games begin. This Pismo Beach hotel meeting space is the perfect setting for business meetings and celebrations alike. 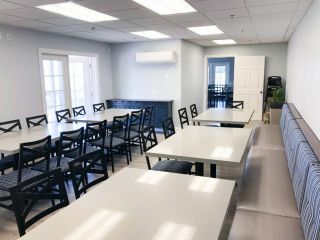 Cozy and bright, The Crow's Nest presents a premium choice in Pismo Beach meeting rooms, with the ability to comfortably accommodate up to 46 guests. Need some space to think? The Shark Tank provides the perfect setting for breakout sessions like group lunches, mixers, socials hours, and more when booked in conjunction with The Crow's Nest. Please note, layout in Shark Tank is fixed. Typically available after 12 PM. Like what you see? 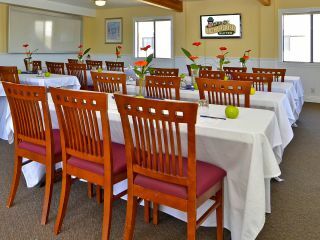 Let Pismo Lighthouse Suites help plan your next event at one of the best corporate retreat venues near San Luis Obispo. Click here to submit a request for proposal or contact our sales manager, Sarah Walker, directly at sales@pismolighthousesuites.com.